Finding the right masonry company for your Baltimore area home or business has never been easier than turning to Roland Slate Service Company. We go out of our way to make sure that our customers are completely satisfied with every job we undertake. Through painstaking work by our expert masons, you can expect a truly flawless finished product. The pros at Roland Slate Service Company have been performing masonry work for more than three decades, making us one of the most experienced contractors in the area. One of our most popular masonry services is chimney repair. The frigid, snowy Baltimore winters can often take a toll on your roof and, specifically, your chimney. When cracks form in the stone, they can fill with water, which freezes and expands, worsening the problem over time. 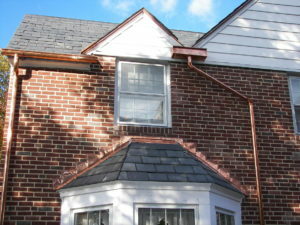 However, our tuckpointing process can curtail the damage by grinding out the bad brick and mortar and replacing it. Not only will this make your chimney look like new, but it will also help to preserve the surrounding roof from further damage and the need for costly repairs. At Roland Slate Service Company, we aren’t just all talk. We back our claims of excellence with ironclad warranties that protect you as the homeowner. Our warranties cover both materials and labor, allowing you to rest easy knowing you hired the right masonry company for the job. To get started with your next project, contact Roland Slate Service Company and find out firsthand why so many Baltimore residents consider us to be the premier masonry company in the area.